While housing and the economy are off to a slow start at the beginning of 2015, positive developments in the labor market are a source of growing momentum, particularly for housing demand. In February, data from the Bureau of Labor Statistics (BLS) indicate that payroll employment expanded by 295,000 jobs and the unemployment rate dropped to 5.5%. It is important to note that the rate decrease was due to labor force participation declines, but the steady growth in payroll employment is a positive factor for household formation and housing demand. Over the last three months, the economy has averaged job creation of 288,000 per month. Home builders and remodelers added 16,700 jobs to the residential construction sector on a seasonally adjusted basis in February. Over the last 12 months, the industry has created 168,000 jobs. Employment growth for the sector has been strengthening recently, adding on average just a little more than 15,000 jobs per month over the last six months. Construction spending from the Census Bureau data details the economic activity supporting that job growth. The pace of single-family construction is up 11.4% year-over-year as of January and multifamily is up 28.9%. For the overall construction market, BLS JOLTS data suggest ongoing turnover among existing workers. Hiring is up over the second half of 2014, but quits and other separations increased at the end of 2014 and start of 2015. 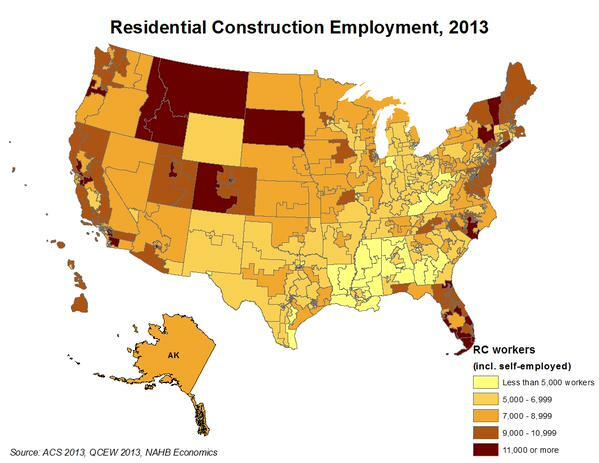 New NAHB research gives geographic detail on residential construction industry employment, including self-employed workers and independent contractors who are not included in some of the BLS data. Using 2013 data, the research finds that 3.5 million people work in residential construction (2.4% of the U.S. labor force), with just under 25% participating as self-employed. Additional job creation should help expand GDP in 2015. Economic growth slowed at the end of 2014, increasing only 2.2%, according to the revised Bureau of Economic Analysis estimate. Growth slowed due to less inventory investment and higher imports. However, lower inventory growth should set the state for growth going forward. The harsh winter took a toll on consumer confidence in February. Both the University of Michigan Index of Consumer Sentiment and the Conference Board Consumer Confidence Index declined in February after soaring to cyclical highs in January. However, households in the lower third of the income distribution reported notable month-over-month income increases. Income growth and additional household formation should help support multifamily construction. And multifamily developers continue to report positive conditions. The fourth-quarter 2014 NAHB Multifamily Production Index was unchanged at 54 (measures above 50 indicate positive market conditions) from the third quarter and up from the fourth quarter of 2013. These conditions are helped by ongoing rising residential rents, which are outpacing inflation by 1.7 percentage points over the last year according to CPI data. Rental vacancy rates also continue to be favorable, with Census data indicating that the rate for 2014 was the lowest since 1995. Existing home sales may rise after a significant drop in January. The NAR Pending Home Sales index increased 1.7% and was up 8.4% from a year prior. Consumer credit also continues to expand, suggesting a willingness to make larger purchases in a low interest rate environment. However, home price gains are slowing, according to major price indices, which may restrict existing home supply while improving affordability. In analysis news, NAHB Economics completed its 800th customized local economic impact of home building report. These reports illustrate the job and economic benefits of home construction, which is dependent on and helps promote employment growth.